The spinal column is made out of vertebrae that are separated from each other by cartilage discs. These discs absorb the shock to the spinal column, acting like cushions. If for any reason this discs get damaged or degenerate, they can tear and the center part of these disks can pop out, compressing the spinal nerves. This condition is known as spinal disc herniation. Any part of the spine can get affected, but herniated discs are more common in the lumbar and cervical part. 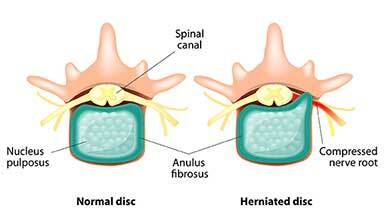 Lumbar disc herniation is far more common than cervical disc herniation. Spinal Disc Herniation is more common among men than women, usually older than 30 or 40 years old. Degeneration of the spinal discs is one of the most common causes of spinal disc herniation. In this case the damage to the discs is gradual, leading eventually to a tear of the affected disc. It is normal as the human body ages with years the spinal discs lose their flexibility and consistency, resulting eventually in weakness and tear of the discs, which will lead to nerve compression and pinched nerve. Trauma of the spinal column, especially in cases of car accidents or work related injuries, is also another known cause of spinal disc herniation. In these cases, the damage of the discs is acute and the signs and symptoms will vary from the severity of the damage to the spine. Lifting heavy things and especially having a work that requires heavy lifting, puts you at a greater risk of suffering from back problems, one of which is also spinal disc herniation. The most common signs and symptoms include: pain in the arms or legs, always depending from the affected part of the spinal column and the nerve root that gets compressed. Except pain, muscle weakness, numbness, tingling of the affected part are also common. Treatment usually depends from the cause and the severity of the signs and symptoms. Conservative treatment is often attempted first, with pain killers, muscle relaxants. Application of ice or heat also can help improve back pain. Nonsteroidal anti-inflammatory medications are commonly prescribed, in order to reduce the inflammation. Once the inflammation is reduced, the signs and symptoms will fade away as the pressure on the spinal nerves is relieved. In cases of chronic pain, steroid injections, epidural steroid injections on the affected area can help control it for several months. Surgery is considered as the last pain treatment options, when the damage to the spine is severe, when the pain is chronic or severe and when there are also significant neurologic deficits. Obese people suffering from spinal disc herniation need to lose weight as being overweight makes this condition worse. Lifting heavy things should also be avoided. Maintaining a good posture and exercising a lot in order to strengthen the back muscles is very important for symptom relief but also for preventing further damage to the spine. Advanced physical therapy sessions would help with the pain relief.